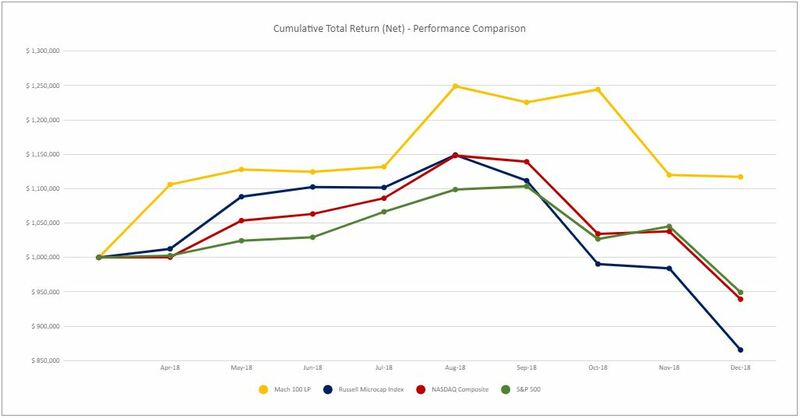 MACH 100 LP seeks to generate superior returns by entering non-correlated positions with high return risk profiles at the inflection point of their catalysts to capture discovery premium and multiple expansion. For the month ending December 31st 2018, Mach 100 LP was down 0.23% gross and down 0.25% net. This compares to the S&P 500 that was down 9.18% for the month; as well as the NASDAQ Composite which was down 9.48% and the Russell Microcap index which was down 12.05%. For the year ending December 31st 2018, (beginning mid-April for inception of Mach 100 LP) Mach 100 LP was Up 16.52% gross and Up 11.71% net. This compares to the 2018 performance of the S&P 500 that was down 6.24%, the NASDAQ Composite which was down 3.88% and the Russell Microcap index which was down 13.08%. December 2018 was the worst month for stocks since the year 1931; and it was the worst year for stocks since 2008. 2018 was a year filled with extreme volatility. As an example, the S&P 500 moved more than 1% in a day 64 times during the year. The Dow swung 1000 points in a single trading session only eight times in its history and five of those took place in 2018. It was a year that was a convergence of several competing factors, including but not limited to: quantitative tightening of interest rates; a trade war with China; slowing economy in China; an ongoing financial crisis in Russia; Brexit uncertainty; stimulus programs in Europe; Middle East oil price dissension; the strongest labor market in the history of modern America; a strong and growing U.S. GDP; record operating results for U.S. companies with a global revenue base (e.g. Caterpillar et. al. ); and the strongest logistics and transportation sectors, globally, ever. This is our global equity investment outlook for 2019: Domestically, we believe that this will be the year that security selection will matter the most and more so than any year since both 2008 and 2011. Run-of-the-mill domestic equity ETF’s are unlikely to outperform capable stock pickers. Micro cap, small cap and even the mid cap, capitalization tiers of equities will generally outperform the large cap and mega cap stocks (e.g. FAANG, etc.). Our view is further reinforced by a secular pattern in which pension funds and mutual funds often reduce their exposure to equities during times of rising interest rates (which we have) and decelerating economic growth (which we don’t have-yet). Group and sector strength will also be tantamount for achieving investment success with those groups and sectors slowing down economically being punished, or at least stalling (excluding highly defensive plays such as sin stocks (alcohol, gaming, tobacco) and utilities that produce strong dividends). Because there is a concern that the economy is slowing (which again we really haven’t seen yet-sans Apple), growth [emphasis on technology and health care-secular growth trends] will outperform value with earnings and margins being critical focal points. At the same time, expensive market valuations will be challenged. Share buybacks will help equity investment returns. Public companies are increasingly buying back their own equity and we are already seeing an acceleration of Form 4 (insider buying) activity. We think highly speculative issues (those without demonstrably improving operating results) will have a tough time and potentially be crushed. Special situations will rule the day! No single region or country offers a uniquely compelling thesis. Country, theme, sector, style and security selection will be critical in 2019. Group and sector rotation is an important part of a comprehensive investment process, as it is a direct reflection of money flow and therefore supply and demand (in the form of trading volume) of various investment instruments (e.g. stocks, bonds, ETF’s, metals, other commodities and currencies); and volume is the fuel of price. Other than utilities, currently, the strongest sectors this month are the same as last month plus one: Retail/Wholesale Auto Parts; Soap and Cleaning Preparations; Beverages (non-alcoholic); Telecommunications (wireless); and Computers (integrated systems, technology (IT) services, database and enterprise software). The weakest sectors consist of: Building (mobile manufacturing and RV); Food and Dairy Products; Retail/Wholesale Jewelry; Oil and Gas (exploration and production); Steel (specialty alloys); Retail (consumer electronics); and Computer (data storage). We find it very interesting that 2 of the top 3 sectors during the past 3 months are retail and advertising, as the strength of these sectors demonstrate that for now, perception is that the economy is not slowing [yet]. In contrast the other sector of the top 3 is retail autoparts, which is a defensive sector and would reflect a belief that the economy is slowing. Currently, (approximately as of this writing) the Fund’s long/short portfolio exposure (which is always subject to change without notice or obligation), is 93% Long, 0% short and 7% in cash. Therefore 93% Net Long. While non-correlating assets reduce market risk (beta) and have the potential to generate much larger than market-related [non-market related] investment returns (alpha), both asset and security selection are crucial. The degree to which non-correlation exists in a portfolio is a direct reflection of its securities held. Some of the non-correlating assets within the Mach 100 LP portfolio consist of 3 PIPE investments. One in medical device, one in gaming and, one in digital media. PIPE is an acronym for Private Investment [in] Public Equity. These are investments made via a private placement (private offering) in a security which is different than, but possesses an underlying publicly traded security. Investment structure, terms and pricing for PIPE investments are different than that of their underlying public security and therefore their valuation and trading behavior is also different; making them non-correlating. Usually 6-12 months after purchase, when these securities become unrestricted, they can be sold as freely trading securities of the underlying equity or convertible equity. This non-correlation is further demonstrated by quantifying the correlation coefficient of the Fund or portfolio to a broad market index or indices, such as the S&P 500. A correlation coefficient of 1 means that the portfolio moves exactly with the markets. An index fund emulating an index is a good example of an investment with a correlation close to 1. We strive to achieve the opposite of an index fund. A coefficient of 0 means that the portfolio has no relationship at all to the markets. A very low correlation coefficient means that most of the systematic [market] risk is being removed. However this does not remove asystematic (individual security) risk from the portfolio. Mach 100 LP aims to have a very low correlation coefficient. Currently, our correlation coefficient to the S&P 500 is .very low at .07. We would much rather possess asystematic (security selection) risk than be subject to the broad markets behavior. Exchange Commission (“SEC”) at www.sec.gov and/or the Financial Industry Regulatory Authority, Inc. (“FINRA”) at www.finra.org/investors. message) to the intended recipient.